Thanksgiving is just not the same without a few savory side dishes to share space with the holiday bird or meat du Jour. 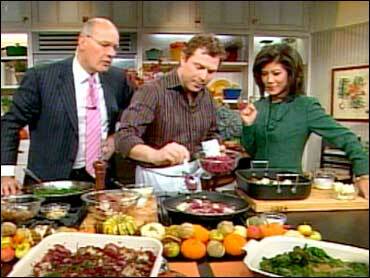 To help you prepare a complete Thanksgiving meal, Early Show resident Chef Bobby Flay created three very simple sides for your consideration. He says dinner is all about being comfortable and cozy. The side dishes prepared should be simple, yet savory and hearty and very familiar. with the cabbage he gave the recipe for Cauliflower, White Bean Puree and Roasted Garlic Broccoli Rabe. Place beans in a large saucepan, cover with cold water and bring to a simmer. Cook for 1-1 1/2 hours or until very soft. Drain beans well. Place in a food processor, add the garlic and heavy cream and process until smooth, season with salt and pepper. Preheat oven to 350 degrees. While beans are cooking, place cauliflower in a large baking dish, add 1 cup of water, oil and season with salt and pepper. Roast in the oven until soft and lightly golden brown. Scrape bean puree into a large oven proof bowl or casserole dish and fold in the cauliflower florets. Garnish with chopped chives and Parmesan cheese. Place dish under the broiler until florets become lightly browned. Then serve. Place 6 cloves of the garlic and the sherry vinegar in a blender and blend until smooth. With the motor running, slowly add the oil until emulsified and season with salt and pepper to taste. Heat a little olive oil and butter 2 tablespoons butter in medium sauté pan over high heat. Add shallots roast until shallots are caramelized. Blanche broccoli rabe in salted boiling water (just until bright green). Shock with cold water to stop the cooking process. Heat a large sauté pan over high heat, add the broccoli rabe and cook until just wilted. Toss in roasted shallots. Add ¼ cup of the vinaigrette and the remaining whole cloves of roasted garlic and cook for 1 minute, season with salt and pepper. Heat butter over medium heat in a large Dutch oven. Add onions and cook until soft. Add cabbage, stir to combine and cook for 5 minutes. Add wine, port, vinegar, cassis and grenadine and season with salt and pepper. Place cover on the pot and cook until cabbage is wilted and very soft, about 1 1/2 hours. Heat oil in a large sauté pan over medium high heat. Add the potatoes and cook until golden brown and just cooked through, season with salt and pepper to taste. Transfer the potatoes to the pot with the cabbage, season with salt and pepper, if needed and fold in the parsley. Serve on a platter.